Editor's Note: Edgar Snyder & Associates is proud to support many impactful organizations in our communities. This month we would like to feature Charlie LaVallee, CEO and executive director of Variety The Children's Charity, one of our long-time community partners. Nearly every day LaVallee's grandfather would bake in the early morning hours and thank customers for stopping into his retail bakery throughout the day. This combination of both a strong work ethic and a love for people has been stitched into the fabric of who LaVallee has become today. His grandfather, Peter Kunst, and mother, Ruth LaVallee, worked at Kunst Bakery to make sure he was able to afford a college education. A Carnegie Mellon University graduate, LaVallee spent his college years working at his family's bakery. For most of his mornings, he would arrive in the classroom still wearing his baker's clothes. LaVallee has spent the entirety of his 40 professional years working for various causes in the nonprofit sector. He said his compassion for people — specifically children — and personal faith are main factors in shaping his career trajectory. Most of his career has been focused on children who are uninsured, children who are grieving, children with special needs, and children who have been abused. I think first and foremost what drives me is that all kids need to have the opportunities to live life to the fullest, whatever their challenges are. Our focus should be on the world that we make for all kids with no child being de-valued or not given opportunities. LaVallee spent nine years at the Shadyside Presbyterian Church, where he served as a parish assistant and campus worker. Following a conversation with his longtime friend, the late Fred Rogers of Mister Rogers' Neighborhood fame, LaVallee took on a new job at the Highmark Caring Foundation. During his time as executive director at the Highmark Caring Foundation, he was able to help establish the Caring Program for Children. This was the first private-sector program in the nation for uninsured children from low-income families, and it served as a model for both the Children's Health Insurance Program (CHIP) of Pennsylvania and the Federal Health Insurance Program. CHIP provides more than 10 million kids with free or low cost health insurance every year. Following the tragic loss of his step-son Josh, he also helped to create the Highmark Caring Place, which is a center for grieving children, adolescents, and their families. LaVallee has worked at various organizations across Pennsylvania including Highmark, Myasthenia Gravis Association, Children's Advocacy Center of Erie County, and the Homeless Children's Education Fund. 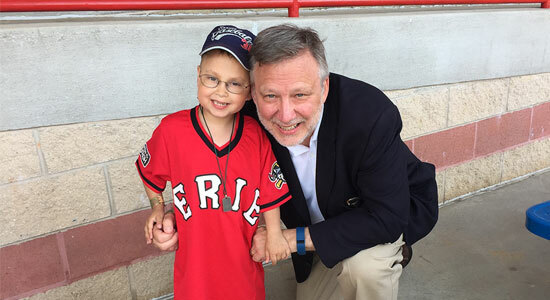 He has celebrated four years in his current role at Variety – the Children's Charity in Pittsburgh as the chief executive officer, or as he calls it, "the chief excitement officer." Variety the Children's Charity is a local, national, and international nonprofit organization founded in 1927 by 11 showmen and theatre owners in Pittsburgh. The organization evolved to become a charity in 1928 and now has a network of 42 offices in 13 countries, and many millions of individual children around the world. The charity focuses on meeting various needs of children who are disadvantaged, sick, or live with disabilities and other special needs. 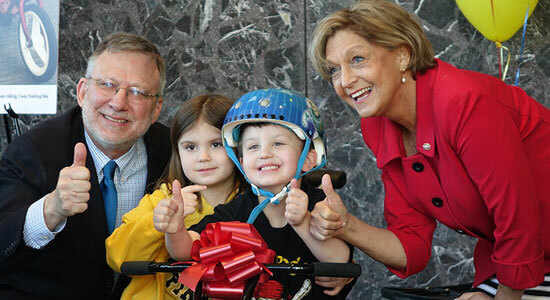 LaVallee helped to launch Variety's "My Bike" Program in November 2012, which provides children who have disabilities with bicycles specially adapted to their needs. The Pittsburgh-area Variety the Children's Charity also has the "My Stroller," "My Voice," and "Peak Moments" programs. These programs provide mobility and communications equipment to children who have disabilities. He serves as a bridge between the cause and the community by helping to show members of the public that they can make a true difference in children's lives. My hope is to have the community see what our kids are capable of, and to realize the life-changing difference we are capable of making in their lives. We are just the helpers really; the moms and dads, grandpas and grandmas, brothers and sisters, they're the people I look up to, we're just trying to help them enable their kids to have the best life possible. Lavallee prizes the time he gets to spend with his own family. On his days off, he can be found spending time with his mother, who has just celebrated her 86th birthday, his wife, Terese Vorsheck, or his children and new granddaughter. A passionate and driven leader, LaVallee continues to spend his days working at Variety — the Children's Charity with the hope that more lives can be positively affected by the programs that his organization offers. It's a privilege for me to do what I do, and I feel blessed to do it. I never anticipated that my life would be transformed by the kids' joy. These children have truly changed my life in such an incredible way.